The profile update form makes it possible for a subscriber to update his/her profile or add more details about himself/herself. 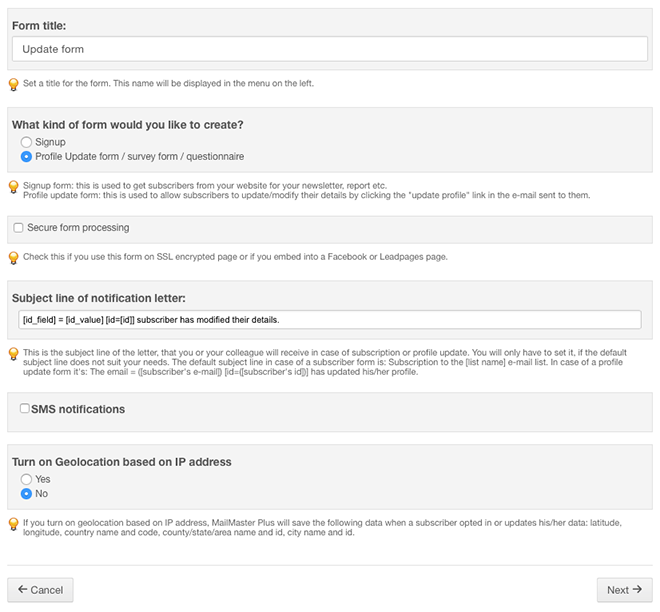 The subscriber can open the profile update form by clicking a link pointed to the profile update form sent in an email. This link in the email is personalized to the subscriber and encrypted so no, one else can have the same link to the profile update form. The usage possibilities are very wide. It can be used as a simple profile update form, so the subscriber can change his/her email address or postal address. But it can be used for the purposes of a survey or poll when, practically, you're asking for more data from the subscriber. The process is very similar to the signup form creating process. In the left menu click the Lists / list name / Forms / Create new form option. The first step of the form creating wizard comes up. This is the same as in the case of the signup form. Type the form name and change the type to "Profile update". Then click the "Next" button. In the second step of the wizard you can define the fields of the form. The subscriber can change the values of these fields in this form. Fields that are not added to the form are not modifiable by the subscriber. You can add fields in the same way as in the case of the signup form (read this tutorial). You can define required fields. 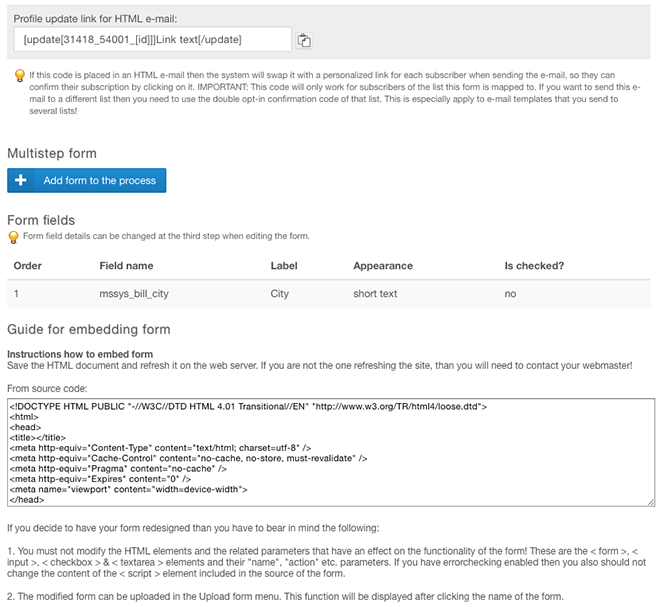 If there is an email field on the form the form will automatically include email syntax check. Select the form design and test the appearance of the form by clicking the "Show form preview" button at the bottom. When you finished click the "Next" button. In the next step of the wizard you can set the confirm screen text. when you type or copy the content of the confirm page in SalesAutopilot (you can use the HTML editor or copy the HTML source directly in the text area). In this case you can personalize the confirm text with merge fields so, you can display some of the subscriber's data, for example the first name. In the HTML editor click to the [...] icon and select the merge tag and click the "Insert merge tag" button. You can directly type the merge tag into the HTML source, just type the field name inside brackets, for example [mssys_firstname] will display the first name. When you finished click the "Next" button. 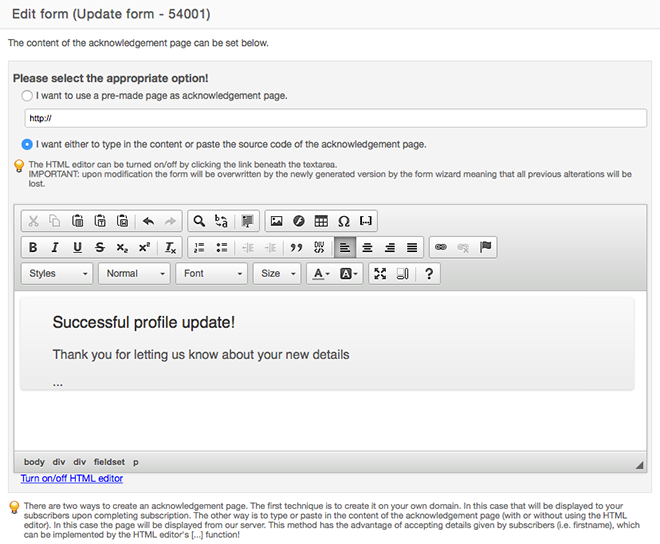 In the last step you can find the source code of the form and the merge tag of the profile update form. Insert the merge tag into the content of your email. When SalesAutopilot sends out the email it replaces the merge tag with a personalized and encrypted link that points to the profile update form. You will need the source code of the form when you want to modify the appearance of the form in such a way that is not possible in the third step of the wizard. When you click the "Next" button SalesAutopilot will send you the source of the form by email to the address at the bottom of the screen. This is your logged in user's email address, but you can type any other email address here. Do not modify the HTML <form>,<input>, <textarea>, <checkbox> tags and its attributes. Do not modify the generated <script> tags content either. 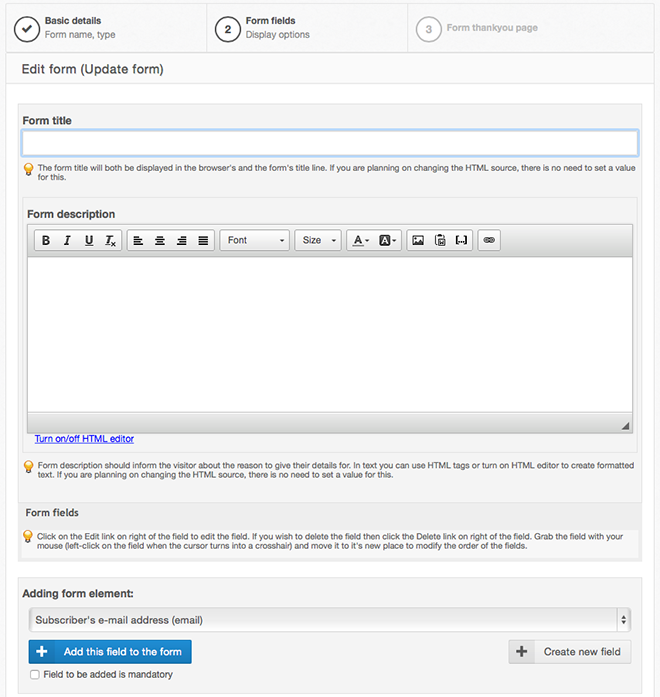 You can upload the modified HTML source in the "Upload form" page. Important: if you edit the form it will overwrite the custom modifications of the one you've uploaded. So if you overwrite the generated form code do not use the form edit wizard. Click the "Next" button to finish the form creating process. The form review screen will appear. If you want to edit the form click the "Edit form" tab.